Yesterday on Twitter, I encountered a stream of tweets about the ABA House of Delegates recent amendments to Model Rules 7.1 – 7.5, hailing them as a game-changing, significant update to the existing regulations. Unwilling to rely on tweets as a primary source, I hustled over to the peruse the changes which are set out in ABA House of Delegates Resolution 101 . Immediately, my spirits deflated and that slogan “my parents went to [exotic destination] and all I got is this lousy t-shirt” popped into my head. Only here, the line went as follows: “The ABA set out to modernize its ethics rules so that they make sense for today’s lawyers and clients…and after TWO YEARS of reports and committees and debates, all we lawyers came away with is a cut-and-paste reorganization of a couple of sections of the rules and a post hoc ratification of innocent conduct – like sending thank you gifts to referral sources, listing contact information but not an office address on a website, recognizing that a directory is not a recommendation or engaging with a prospect on Twitter without a 700-word advertising warning tacked on to the 80-character tweet or telling us that — that lawyers have known or been doing whether or not the rules allowed it because really, who’s going to even take the time to enforce this silly minutia? Eliminates the requirement to label targeting mailings as advertising on the theory that today’s consumers are sophisticated enough to distinguish an ad from substantive or educational information. Not only do the changes merely approve conduct that most lawyers have engaged in any way whether formally permitted or not (with the exception of labeling mailings as ads), the rules also state the obvious. 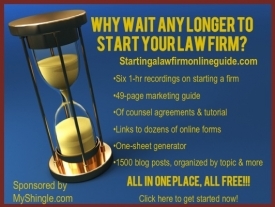 The comments to the rules explain that: “Directory listings and group advertisements that list lawyers by 163 practice area, without more, do not constitute impermissible “recommendations.” (Resolution 101 at 4:162-163). Seriously, did any lawyer ever believe that procuring a listing in the yellow pages meant that AT&T was recommending the service? The rules also define a “lawyer referral service” as “any organization that holds itself out to the public as a lawyer referral service.” Resolution 101 at 5:202-203. OK – so does that mean that Avvo (or similar platforms) isn’t a referral service contrary to what state regulators to date have held? After all, Avvo characterized itself as a marketplace, not a referral service. Why won’t the ABA just resolve these burning questions instead of putting the questions off and letting the uncertainty kill innovation? Our profession sits at a crossroads. The bar needs leadership and action on these questions, not scriveners to reorganize paragraphs (message to ABA: computers can do that now!). If these tepid rule changes are the best that the ABA can do, then we should just let the organization die on the vine right now, because it simply doesn’t have the ability to lead lawyers into the future.